On 11th January, we protested outside the BBC at its refusal to cover the plight of Palestinian hunger strikers. 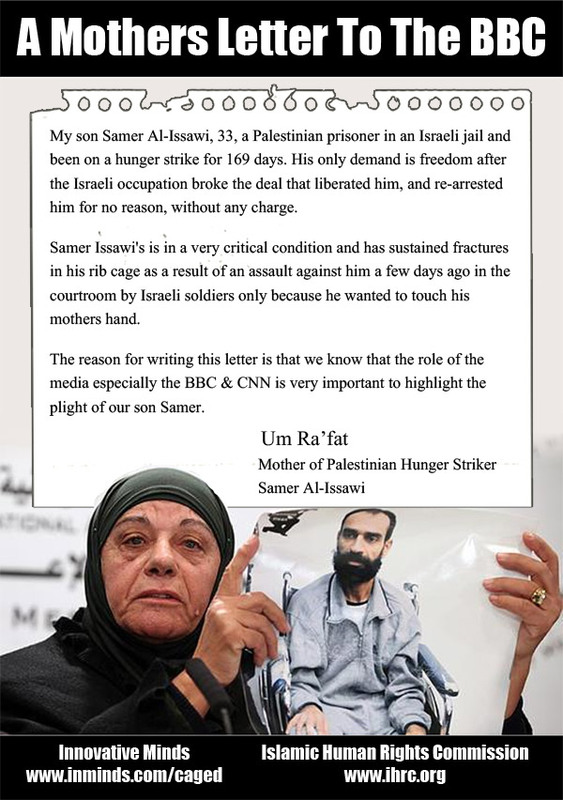 We delivered a letter to the BBC asking for an explanation and a change in policy, the letter (reproduced below) also included a passionate message from Um Ra'fat, the mother of Palestinian hunger striker Samer Al-Issawi. Today is Palestinian political prisoner Samer Al-Issawi's 169th day on hunger strike, and fellow prisoner Ayman Sharawna having been on hunger strike nearly 6 months before suspending his strike for a week is once again fasting for his freedom. Both prisoners are being held by Israel without charge or trial. According to the internationally brokered deal to release captured Israeli corporal Gilad Shalit both Sharawna and Issawi should be free men today but Israel reneged on its agreement and rearrested both men after Shalit had been released. The BBC describes its mission as one to "inform" and "educate" and the news in particular is described as "providing trusted World and UK news.." so why have you not covered their story and those of fellow Palestinian hunger strikers? The search engine Google has indexed over 21 million articles from the BBC website yet it returns no results from the BBC for Samer Issawi or Ayman Sharawna. Neither prisoner has ever been mentioned by the BBC - those 21 million articles.. empty of any reference to Palestinian hunger strikers Issawi and Sharawna, both nearing death after nearly six months without food. If we do a quick search on Google for "Gilad Shalit" it brings back around 1,120 articles from the BBC which includes around 50 articles from 2012! Shalit was released over a year ago in October 2011 and yet he is still news worthy for the BBC. The last article on him by the BBC is from October 18th 2012 - a special on the anniversary of his release! The Shalit release anniversary article reports of his "ordeal", the "psychological effects", "trying to come to terms with his fame" the ordeal of the media following "his first bicycle ride after he returned home.. [his] trip to Paris to visit President Nicholas Sarkozy and a meeting with New York Mayor Michael Bloomberg.. at a concert of the popular singer, Shlomo Artzi, who dedicated a song to him; at various sports events and on the set of the US television drama series, Homeland.." Contrast this 'ordeal', which is newsworthy for the BBC to report, to the ordeal Palestinian prisoners on hunger strike are going through TODAY. Just two weeks ago Samer Al-Issawi, a wheelchair bound skeleton of a man barely breathing after 140 days without food, was brutally attacked by Israeli guards in the courthouse in front of an Israeli judge, who didn't intervene, as guards punched the dying man in the head and chest resulting in broken ribs. They then attack his mother and sister, all this in front of the cameras - captured on video ready for any news channel to broadcast.. but not the BBC - your mission to 'inform' and 'educate' apparently doesn't extend to Palestinians? 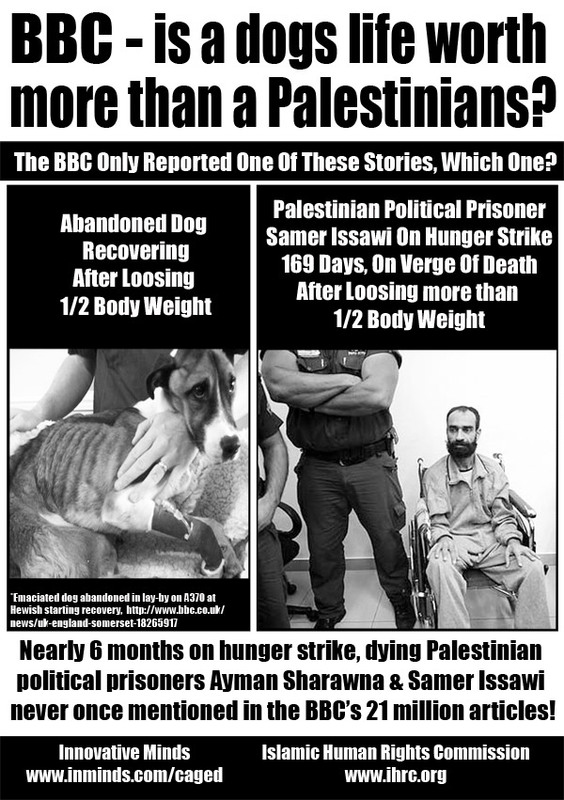 An emaciated dog that has lost half its weight due to being abandoned is afforded an article by the BBC which includes a large colour photo, but not Samer Al-Issawi who after 169 days without food has lost more than half his body weight, not even one mention of his name. Why? The BBC is principally funded by television licence fees - 82% in 2011 ( £3.6 billion). Such blatant bias by omission in its reporting is unacceptable and we as TV licence holders demand the BBC follow its remit to inform and educate by covering the issue of Palestinian hunger strikers. We have received a message from Palestine, from the mother of Samer Al-Issawi to the BBC which we have included below. My son Samer Al-Issawi, 33, a Palestinian prisoner in an Israeli jail and been on a hunger strike for 169 days. His only demand is freedom after the Israeli occupation broke the deal that liberated him, and re-arrested him for no reason, without any charge. Samer Issawi's is in a very critical condition and has sustained fractures in his rib cage as a result of an assault against him a few days ago in the courtroom by Israeli soldiers only because he wanted to touch his mothers hand. The reason for writing this letter is that we know that the role of the media especially the BBC & CNN is very important to highlight the plight of our son Samer. We would like a reply, thank you. 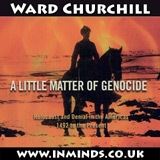 After nearly 5 weeks we still have not received any reply from the BBC. Not only have they not replied, they have not even had the courtesy to sent us an acknowledgement of receipt of the letter. As the BBC prevented us from entering the building to personally hand the letter to the Director General Tim Davie it was given to the Duty Facilities Manager of BBC Workplace who later confirmed to us via email that she had handed it to the Director Generals Office. 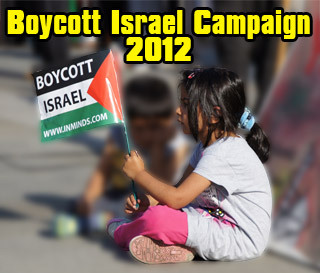 The BBC is still enforcing a reporting blackout on any coverage of the Palestinian hunger strikers. 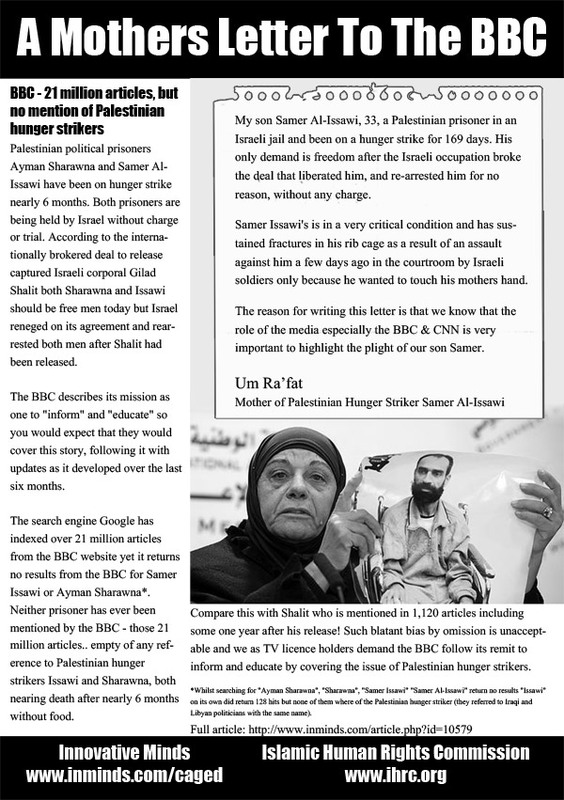 Still no mention of hunger strikers Samer Issawi or Ayman Sharawna who is now 7 months without food. Both Samer and Ayman are dying. They have shown unbelievable strength in resisting their oppression. The very least we can do is give voice to their heroic resistance, to their hunger strike. We need to ensure the media is shamed in to covering their story. Publicity for their plight is the first step towards their liberation. Please join us this Monday as we once again stand outside the BBC to demand they report on the hunger strikers.